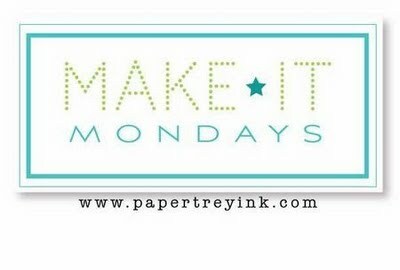 I am here with a card for this week's Make it Monday #43, where Dawn teaches us how to make a pleated ribbon border for our projects. You can see the video here. This is my first time trying this technique, and I have to say, my ribbon looks more scrunched than pleated. However, I am still happy with the way the card came out. Let's just call these pleats 'unique'. 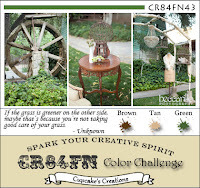 I based the layout of this card on this card by Laurie at Soapbox Creations. I am cutting it pretty close, but I am making my second post of the day today in order to sneak in a couple of cards for this week's Play Date Cafe PDCC108 challenge. You can see my first post today here. 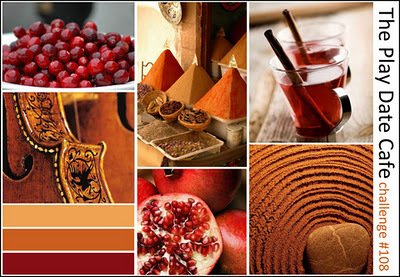 The colors we were given to work with were maroon, copper and tumeric. I used Scarlet Jewel and Terra Cotta Tile papers and Amuse Currant ink and Colorbox Roussilon and Amber inks. I wanted to use PTI's Simple Sunflower stamps and dies, since I hadn't really used them much. I couldn't decide if the sunflowers should be Currant or Roussilon, so I ended up making two cards. The first card was inspired by this card by Amy at Stamp-n-Paradise. Which card do you like better? I've got a card for this week's CAS-ual Friday's CFC #29 sketch. I'm still having fun playing with my new Amuse inks. I used Eucalyptus, Heather, and Fern on this card. 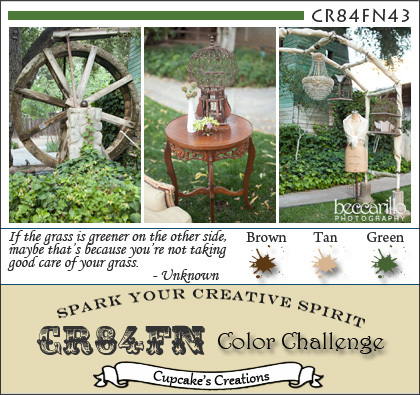 I decided to use this week's CR84FN43 color scheme of brown, tan and green. I used Amuse ink in Fern and Latte, and Memento ink in Rich Cocoa. My sister and her family were just visiting us for Thanksgiving, and one day, my 17 year old niece said those magic words every crafter wants to hear: "Aunt Joyce, can you teach me how to make a card?" Well, I didn't need to hear anything more than that. We were off to the races. We had such a good time together. She is a quick study, a crafty gal, and super neat. I told her I would post her creations for all my friends to see. She and her family left this morning, and my craft room seems especially quiet. I sure hope she comes to visit again soon. 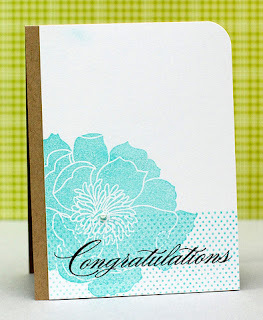 Better late than never--I'm here with a card for Make it Monday #42: Layered Background with Sentiment Stamps. I really like this technique, and really like the stamp set I chose. I don't know why I don't use this set more often. I finally got my shipment of Amuse inks, and I used Fern on this card. I'm actually not too sure about this card, but I am posting it anyway. I have a few more Christmas cards to show you that I have just sent off to Cards that Care, a challenge to collect Christmas cards for the elderly in nursing homes. 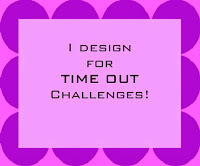 I am also entering them into the Passion for Papertrey holiday challenge. They are all variations of A Wreath for All Seasons, a set I bought back in July, but didn't ink up until just now. I used the woodgrain IP on all the cards. 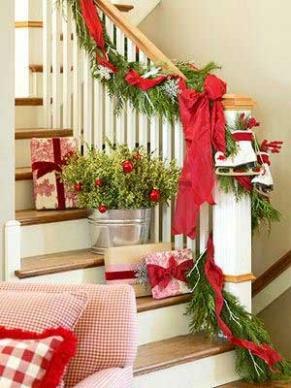 Sentiments are either from Wreath for All Seasons or Peaceful Garden. My friend Cathy from Empty Nest Crafters and I made a card together today for this week's Waltzingmouse Sketch Challenge WMSC74. Meet Golda, an Irish-Jewish female snowman, made in sunny Southern California--here to wish you a Happy Chanukah. Cathy cut and stamped the snowman with WM Nordic Winter. Then she sent the snowman to me for the finishing touches. 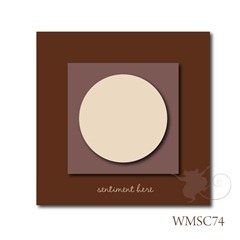 She even sent me her WM Flourishes- Scallops and Dots set, which I used to create the background and the snowdrifts. Great teamwork, right? 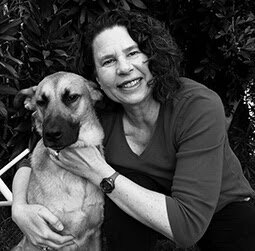 If you want to see Golda's friends, Moishe, Frayda and Gittel, click here. I found a beautiful Hero Arts Christmas tree stamp at Michaels the other day, on sale for only $5.99. 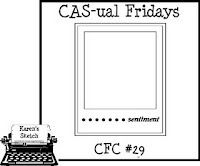 Since I don't have any Christmas tree stamps, and I am trying to make lots of CAS cards for Cards that Care, I just had to bring this stamp home. I love it when I can indulge myself, and pretend I am just doing a good deed. 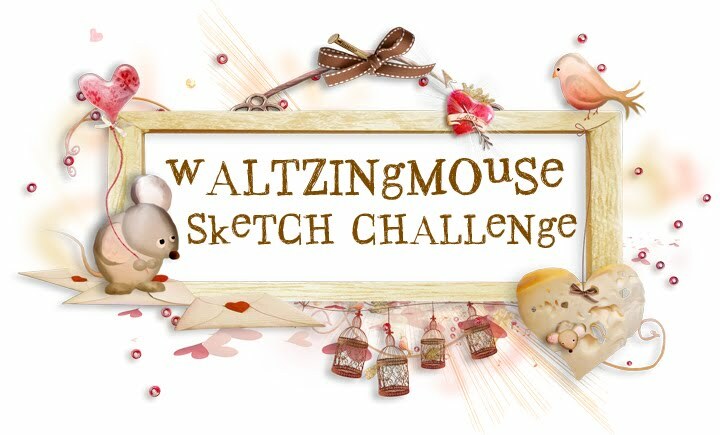 I am going to enter these cards into the Hero Arts November Challenge to 'bling it up'. I used Colorbox Evergreen ink and clear embossing powder on the tree. It's hard to see in the picture, but the sentiment, from Wreath for all Seasons is stamped in black. I used red jelly dots on the tree for the bling. This one is the same idea, but I used blue ink for the tree and clear jelly dots for the bling. Scarlet Jewel paper with gold embossed tree. SU Navy paper, silver embossing for the tree and sentiment, and a bit of silver shimmer paper for the trim. Today I am playing along with Case Study #66. The challenge is to case this beautiful card from Krissi Ng. 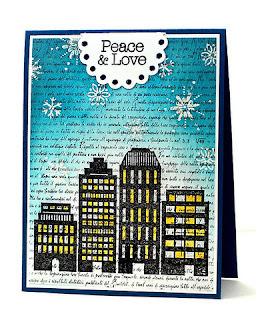 I picked up on the snowy background, the buildings as a focal point, and the sentiment tag at the top of the card. This seemed like the perfect opportunity to pull out one of the first stamps I ever got--an old favorite that has been neglected lately--my Sillyscape stamp from Hero Arts. Sorry that this is not such a great photo--I think there was a reflection from the flash. I started with SU Navy paper and stamped the Hero Arts Envelope background in white. 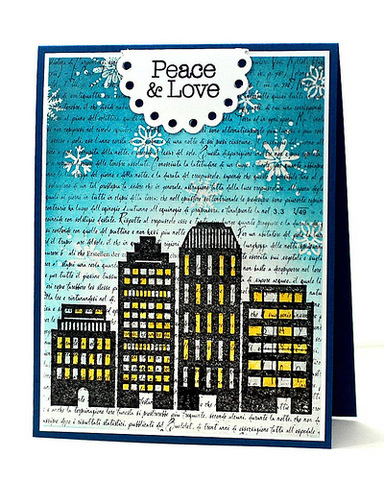 Then, I stamped and embossed Sillyscape in black, and stamped PTI Peace Be Still snowflakes in White. I used a white gel pen on some of the windows and Gelly Roll Clear Star on some other parts. In the photo, it looks yellow, but IRL it looks glittery.